Hey everyone and thanks for your patience. The last few weeks have been unusually busy for me with work, many late evenings and not being able to find the right peace of mind to write in what little downtime there is. Later tonight, I’ll do a “spotlight post” featuring one of my favorite issues from the archives, Daredevil #304, by D.G. Chichester and Ron Garney. Before we get to that, I just wanted to do a little recap post of things to read online and what’s going on generally. ComicBooked.com‘s Colin Bell did an interview with yours truly that’s now up on their site. They also have interviews with Robert from the Matt Murdock Chronicles and the inimitable Kuljit Mithra from ManWithoutFear.com. These interviews are part of their Daredevil month and they have many other entries on the character as well, all of which can be found here. Another article online I really enjoyed was the Daredevil feature on CBR that consisted of a conversation about the character between Ryan K Lindsay and Tim Callahan. There’s a part one and a part two. Enjoy! I also managed to get Antony Johnston on the phone for an interview Wednesday night. There’s still work to be done in transcribing it and getting it over to Antony before I can post it, but I should have it up in about a week so stay tuned. 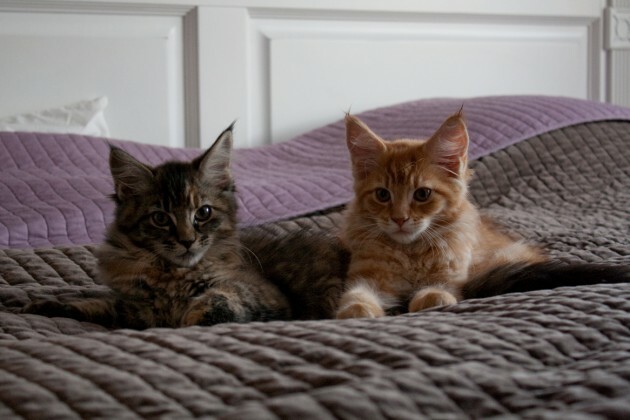 Oh, and completely off-topic (but awesome), my kittens Murdock and Elektra arrived Saturday. They are ridiculously tiny and not the least bit fierce-looking, but very cute. Check out pictures of them below! Great interview with Comicbooked.com. I’m right there with you about the movie. I’d never followed Daredevil. I had read some DD stories in the late 90s, mainly Miller’s stuff at the behest of a buddy which was great and Smith’s 8 issues which…. wasn’t. Basically the same reason I didn’t like Smith’s was the catholicism being shoved down everyone’s throats. Then the movie hit and for all its flaws, it made me see Matt Murdock for the great character he was, and I jumped into Bendis’ run and then started grabbing back issues and trades. The lack of the brotherly friendship in The Man Without Fear between Matt and Foggy. I thought Miller nailed that in the admittedly few pages he devoted to their friendship in college and then after law school. I know I am in the vast minority on this but I’m gonna say it. For all the flaws in the Daredevil movie, Ben Affleck was not one of them. Affleck was spot on as Matt Murdock. FWIW, Robert, I agree about Affleck. He wasn’t especially impressive in costume, but as Murdock I thought he nailed it.